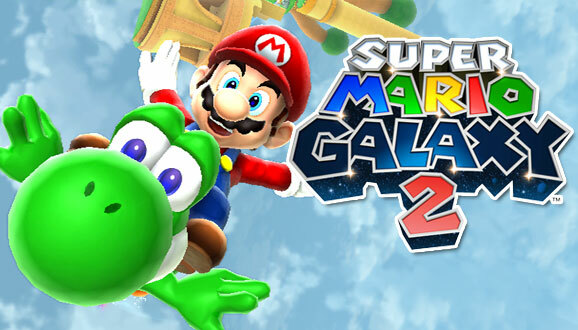 I don’t mean to hate on the game right off the bat, because it truly is not an awful game. Everything about it is about as good as it could possibly be: There are lots of puzzles, reasons to go back and replay those puzzles, and even a few mini-games to string the game along. The problem with I Spy: Universe isn’t in the design of the game, it’s in the concept. What I mean by that is that the game is very well designed. By the standards of being an entry to the I Spy franchise, it’s about as good as it gets. The issue comes when you realize that there are a lot more interesting things to be doing on your DS than playing I Spy. 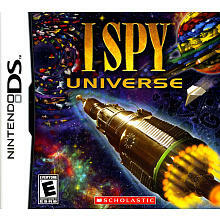 When things like New Super Mario Bros. or Phoenix Wright are available, gamers really will not find much to like about I Spy: Universe. However, there is an audience for the game, and compared to what is generally available to that audience (I’m looking at you, Petz) it is actually a pretty fun little package. You see, it is clear who I Spy: Universe was made for, and for that audience the game is great. It’s a game made for younger kids, probably aged 6-10, and that aim definitely shows in the gameplay. The goal of the game is to find objects to help re-light the sun and save the whole universe. It’s obvious that this story was merely created as a placeholder to string together all of the puzzles, but I almost feel like the game would be better off without any story at all. Things would’ve felt more in place if they would’ve just played it off as a puzzle game rather than trying to disguise it with a story, since it’s not like there are any characters or flow to the game. Because games with useless stories are bad! What “I Spy” really excels at is exactly what you’d think: Being an “I Spy” experience on the DS. To do this, the top screen can switch between showing you the full picture of the puzzle and displaying the hints of things you’re supposed to look for, while the bottom screen shows the zoomed in portion of the picture you are looking at. You can drag the image around or use the control pad to move the portion you’re looking at, and you can select an item which is on your “I Spy” list simply by tapping it with your stylus. There is a hunt system, which shows you there area where one object is, but you can only use it so often. After using it once, the ability to use it again “recharges” and you have to wait a bit before being able to access the skill another time. In the sense of doing what it is supposed to do, I Spy: Universe is as good as it gets, but I can’t help but think of a few things that would make it even better. The thing that made my favorite I Spy books so compelling was the awesome set of scenes that you could look at while searching for the items listed. 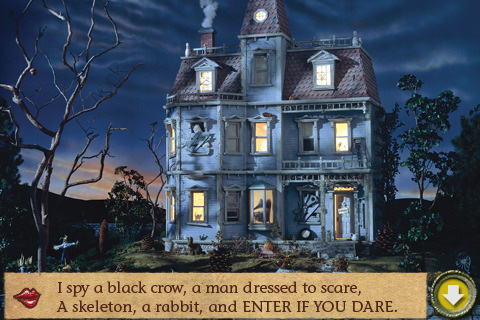 This was especially prominent in the Haunted House book, because all of the scenes were different locations in/around a haunted house and they were all connected in some way or another. It started by the front gate of the house, then into the front yard, then the next scene was the living room, etc. I Spy: Universe, however, ditches this strategy for a sort of “here look at this box of toys and find them” approach. Each puzzle is sort of a random assortment of objects over different backgrounds to look through, with no interesting things to look at and no context for them other than the fact that you’re looking for objects in them. I am telling you now, completely honestly, that I would buy a DS game of I Spy: North Pole or I Spy: Mall if the scenes were all connected and they had a lot of cool easter eggs. Unfortunately, I Spy: Universe misses in this sense. The bottom line about this game is that it is worth your hard earned cash, but only if you like playing I Spy. If you do, then great, I highly recommend this title. Generally, an I Spy book runs for about $10 and has around 12 puzzles in it. I Spy: Universe is $20 and has 12 pictures, but 36 actual puzzles, so I’d say it’s worth the budget price you’d pay for it. Bottom Line: I said it before and I’ll say it once again: It’s not a bad game, nor is it poorly designed. It’s I Spy, through and through, and in that sense it’s as good as it gets, but if you’re looking for something beyond I Spy, I suggest you shop elsewhere. Note: Review copy provided by Scholastic.